أقدم لكم دورة تمهيدية شاملة في SQL Server 2014 BI. وتقدم هذه الدورة التدريبية باللغة العربية، وتهدف إلى المساعدة فى التقديم للمفاهيم الأساسية للمهنيين المتخصصين فى قواعد البيانات عامه وبخاصه SQL Server BI في محاولة متواضعه منى لنشر هذه المعرفة والعلم بين اخوانى الناطقين باللغه العربية. Dear Colleagues of the Database World! 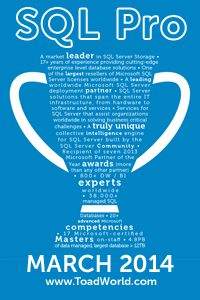 Thank you and good luck future SQL Server Professionals world wide! Special thanks to my friends Mohamed Elsharkawy for his help and support with this production. Special thanks to my friends Mohamed Elsharkawy, Jihad Abouhatab and my brother Islam El-Ghazali for their help and support with this production. The SQL Server Parallel Data Warehouse and SQL Server Fast Track Data Warehouse are very high end builds of Microsoft’s SQL Server 2008R2 product; and SQL 2012 in the future. I’ve been intrigued by these products so I’ve started to learn about it. They have both been on the market for a while, but I’ve just recently been exposed to the technology and it has been exciting to learn more and more about it. Module 2 talks about the PDW architecture. Module 4 talks about the Fast Track Datawarehouse; which is a product that sits between your custom build of SQL Server and the PDW. Of course all the other modules are useful, but just in case you wanted to take a quick dive into material related to the PDW you should go for Modules 2 and 4. An interesting post by Gethyn Ellis about an issue he encountered using Availability Groups. Follow the link above to read more.